Making Andrew Jackson Great Again? 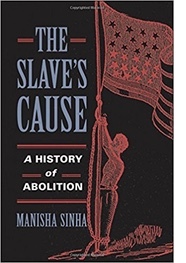 Manisha Sinha is the Draper Chair in American History at the University of Connecticut and the author of The Slave’s Cause: A History of Abolition (2016). Thanks to Donald Trump, Andrew Jackson is in vogue again. A few weeks ago Trump tweeted “Go get the new book on Andrew Jackson by Brian Kilmeade…Really good. @foxandfriends.” Trump of course fancies himself as an heir to Jackson, a comparison first peddled by the now out-of-favor Steve Bannon. One has lost count of the number of times Trump has been photographed with a portrait of Old Hickory looming behind him, most inappropriately during a ceremony honoring the Navajo code talkers, veterans of the Second World War. It is not clear if Trump has read Kilmeade’s new book on Jackson and the Battle of New Orleans, but he is reportedly a diligent viewer of Kilmeade’s morning show on Fox news. The two form apparently a mutual admiration society. Having recently presented at a conference on Andrew Jackson marking his 250th birthday at Yale University, I am struck by how this historical analogy is more false than true. Perhaps even the ghost of Jackson is protesting since the historic magnolia tree he planted at the White House in honor of his beloved wife, Rachel, has finally given up and will be removed. We are living in an age of not just fake news but fake history. Traditionally, Jacksonian Democracy, the elimination of property holding qualifications for voting and an attack on Hamiltonian economic views, was understood to represent the expansion of American democracy, albeit for adult white men only. Arthur Schlesinger Jr. put forward this view in his magisterial The Age of Jackson in 1945. Many American historians since have retold that familiar story of what was called the Republican-Democratic Party, drawing a linear genealogy of American democracy from Jeffersonian Republicanism and Jacksonian Democracy to FDR’s New Deal liberalism. Counter narratives that portrayed Jackson as an Indian killer and slaveholder have long inhabited the edges of the history of Jacksonian Democracy. More recently they have occupied center stage. But the history of Andrew Jackson, indeed Jacksonian Democracy or as it was properly called by many contemporaries, “the white man’s democracy,” is a bit more complicated than either version. Today, Trump and his followers have sought to encompass Jackson and his newfound admirer under a broad blanket of populism. But this attempt reveals the disjunctures rather than the similarities between the white man’s democracy of Andrew Jackson and the alt-right, white nationalism of Trump, a product as much if not more of fascist, anti-democratic forces of the twentieth century rather than of its nineteenth century antecedents. Careful historians of the age of Jackson have shown that the institution of white manhood suffrage preceded the election of Andrew Jackson, even though the process continued to unfold during his Presidency, and that the white man’s democracy in the United States was accompanied by the disfranchisement and severe curtailing of black men’s suffrage in many northern states. Jackson represented the coming of age of the “common man” or what I would call the common white man. Moreover his economic policies that would define the Second Party System of the American Republic, anti-Bank of the United States, anti-infrastructure, and anti-protection or what was known as the American system, proved to be a windfall for “pet” Democratic state banks and champions of free trade. When it came to white women, Jackson’s chivalry, his undying fidelity to his dead wife and his determination to uphold the honor of Peggy Eaton, wife of his Secretary of War, even at the cost of risking his administration, stands in glaring contrast to Trump’s abusive attitudes and behavior toward women. While it is important to note the limits of Jacksonian Democracy, political, social, and economic, it is clear that Trump’s accession, personality, and policies have little in common with Old Hickory’s. In 1824, Jackson was denied the White House according to his supporters by a “corrupt bargain” between John Quincy Adams and Henry Clay, who combined their support in the Electoral College to defeat Jackson, winner of the national popular vote. In 1828 and 1832, Jackson won the Presidency by overwhelming majorities in the popular vote count. Trump’s election by the Electoral College, while losing the popular vote to Hillary Clinton by nearly three million votes, the most in American history in a presidential election, could not be further from this scenario. Whatever kind of populism Trump evokes, he cannot even lay claim to the attenuated, racially exclusive nature of Jacksonian democracy. The profoundly anti-democratic nature of Trump’s election, aided by America’s rotten borough Electoral College, state and local level Republican schemes of voter suppression and gerrymandering, stands in glaring contrast to the course of American democracy in the nineteenth century when the electorate expanded dramatically and over 70 percent of eligible male voters typically cast ballots in elections. In contrast, a minority of a minority voted for Trump. Even at the symbolic level, while Trump blithely lied about the size of his inauguration crowd, a contemporary critic had this to say about the “multitude” at Jackson’s inauguration, the largest since the establishment of the Republic, that literally stormed the White House: “The Majesty of the People had disappeared, and a rabble, a mob, of boys, negros [sic], women, children, scrambling fighting, romping.” Jacksonian democracy presaged the emergence of a new kind of mass democratic politics in the United States. Trump’s attempt to claim Jackson’s economic populism, with all its limitations, is similarly misguided. Trump and the party he represents have made it clear that theirs’ is the party of the 1 percent, the plutocrats and billionaires, even faux ones like Trump himself. The uneasy political alliance between southern slaveholders and northern plain folk in the Democratic Party built painstakingly by Jackson’s lieutenant, Martin Van Buren, would unravel under the pressure of the slavery controversy by the eve of the Civil War. But the Republican Party of today is an ideologically pure party of reaction, religious, economic, social, and political. While remaining closed to African Americans, the Democratic Party founded by Jackson was an immigrant friendly one, as long as they were white. Irish and German Catholics flocked to its standard put off by the evangelical, Protestant tone of its rival, the Whig party. Today of course nativism is a hallmark of the modern GOP and Trump has perfected it by abusing Americans of Mexican descent and with his idiotic plans to build a border wall. As Lincoln, calling out nineteenth century nativists, put it, “As a nation, we began by declaring that 'all men are created equal.' We now practically read it 'all men are created equal, except negroes.' When the Know-Nothings get control, it will read 'all men are created equal, except negroes, and foreigners, and Catholics.' When it comes to this I should prefer emigrating to some country where they make no pretense of loving liberty – to Russia, for instance, where despotism can be taken pure, and without the base alloy of hypocrisy.” Trump’s campaign, it appears, took that advice literally. 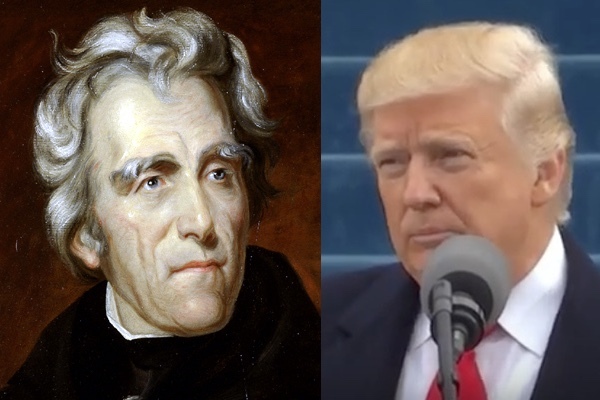 The one part of Andrew Jackson’s legacy that Trump’s many critics, historians and pundits, have referred to in comparing him to Jackson is the latter’s reputation as an Indian fighter and enslaver. Even the most ardent of Jackson’s admirers cannot prettify his record here. During the First Seminole War, in defiance of direct orders, he pursued and killed hundreds of Creeks and as President, presided over the infamous Trail of Tears that forcibly displaced nearly 40,000 Cherokees, resulting in the death of around four to five thousand. Jackson’s personal fortunes were linked to the expansion of the slavery-based Cotton Kingdom, as a slave trader and slaveholder. The casual cruelty in his directive to pay ten dollars for a hundred lashes each inflicted on his runaway slave belies myths of a paternalistic slaveholder reproduced uncritically as recently as in a new Jackson biography by Steve Inskeep. Like a majority of the slaveholding republic’s early Presidents, Jackson was a slaveholder who had no qualms about owning human property or dispossessing Native Americans from their lands. At the same time, Jackson’s adoption of the Creek orphan, Lyncoya, and his call to arms to the black population during the Battle of New Orleans reveals a complicated racialist outlook. Adoption signaled not just benevolence but assimilation and cultural death for Native Americans, a step above extermination. Jackson was also willing to recruit not just free blacks but also the enslaved in defense of the slaveholding republic during the War of 1812. African American abolitionists consistently reprinted Jackson’s proclamation of gratitude to the free blacks of New Orleans right down to the Civil War in their demands for citizenship. In 1836, he pardoned Arthur Bowen, an eighteen-year old enslaved man sentenced to hang for threatening his mistress, at her behest. He deliberately arranged that the pardon should take effect on July 4th. Jackson’s staunch nationalism at times trumped his provincial identity as a southern slaveholder. He is a crucial figure in the development of the antebellum American state, a government of courts and parties as the political scientist Stephen Skowronek has called it. The antebellum party system emerged defined by his persona and policies. One can also trace the origins of the imperial Presidency to Jackson, much earlier than the twentieth century as most historians have argued. His Whig critics called him King Andrew and a recent biographer J.M. Opal, draws attention to his vengeful personality. But Jackson’s actions against perceived enemies of the nation state were much more than the result of fits of pique. He held no truck with abolitionists, demanding the federal censorship of their literature. But he also famously held no truck with South Carolinian nullifiers and the extreme states rights constitutional views of their avatar, John C. Calhoun. Jackson’s forceful proclamation against nullification or the alleged right of a state to nullify a federal law, which he linked to disunion and the tyranny of minority rule, was the one precedent that Lincoln could evoke in issuing his Emancipation Proclamation in the midst of Civil War. Unlike Jackson, Trump has kind words for those who have committed treason against the United States or have been defined as its enemies, an odd position for someone so devoted to the Stars and Stripes that he has attacked football players kneeling before it. Trump is particularly fond of neo-Confederate Nazis giving them the respect he has withheld from African American soldiers killed in combat. Trump’s inane suggestion that Jackson could have avoided the Civil War through compromise would probably surprise Jackson’s critics and supporters alike well acquainted with his uncompromising defense of the American Union and willingness to bring the country to the brink of war during the nullification crisis over federal tariff laws. Like many historians, I have studied Andrew Jackson, and Trump is no Jackson. Ideologically, the GOP today, the party of Trump is the party of Calhoun rather than the party of Jackson. Contrast also Jackson’s liberal use of patronage to staff federal appointments with Trump’s failure to fill many crucial positions in government. Trump and the current Republican Party’s anti-statist views would do away with government in either its earlier democratic or modern technocratic and bureaucratic incarnations. In the long history of the American Presidency, Trump, as historian Sean Wilentz recently argued, has no precedent, and his attempt to evoke Jackson’s legacy to legitimize the continuing horror of his Presidency is as many of his actions and words, implausible.